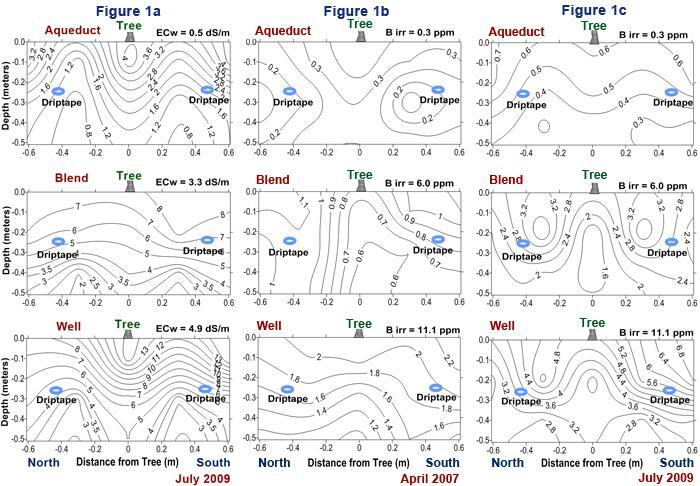 Contours of pistachio soil EC, measured at the 5-year mark in the study, (Figure 1a, below) take on a concentric pattern around the tree as water is applied by two buried drip tapes on either side of the tree. These young trees have the greatest root concentration within 2-3 feet of the trunk. The movement of water, either taken up by the roots or evaporated, concentrates the salts around the crown of the tree. Over the last 5 years, continuing root development creates a gradient that pulls salts and water farther away from the trunk and evens out the salinity pattern over the zone shown by the transect contours. However, salt is still concentrated to the south side due to sun angle. Total soil B in the top two feet of soil, as determined by nitric acid digestion in 2004, showed that most of the native B in this soil was in an “adsorbed” phase at a concentration of 17 to 20 ppm (that is, bound to soil particles and thus, unavailable). A similar digestion performed on all sample sites Fall 2007 showed total B to two feet at 27 to 28 ppm regardless of treatment (Figure 1b). Theoretically, there should have been a significant increase in total B for the Well treatment over the Aqueduct treatment, but these results show the highly variable nature of native B concentrations within the soil and the huge potential to sequester irrigation water B into the soil matrix. Still, this ability may provide only marginal help to safeguard the tree from uptake of excess B as confirmed by the noticeable leaf burn and tissue levels of excess B in the Well treatment. Until 2009 (the 7-year mark in the study), contours of soil saturation extract boron (Figure 1b) showed only a moderate increase of 2 to 3 ppm in the Well treatment compared to the Aqueduct treatment rootzone, despite the very high irrigation water concentration of 8 to 11 ppm. But 2009 year may have been the “time bomb” point at which most of the adsorption sites become saturated and more boron remains soluble as shown in the Well treatment contours for 2009 (Figure 1c). Figure 1. Soil salinity patterns in pistachio blocks. 1a. Pattern of EC measurements, 2009. 1b & 1c. Pattern of boron measurements. 2007 and 2009.